Final Candidation takes you back in time, eight weeks before the 2013 election. Anything could still have happened. Will Renzi be able to lead the Democratic Party? What alliances will current Prime Minister Mario Monti choose? 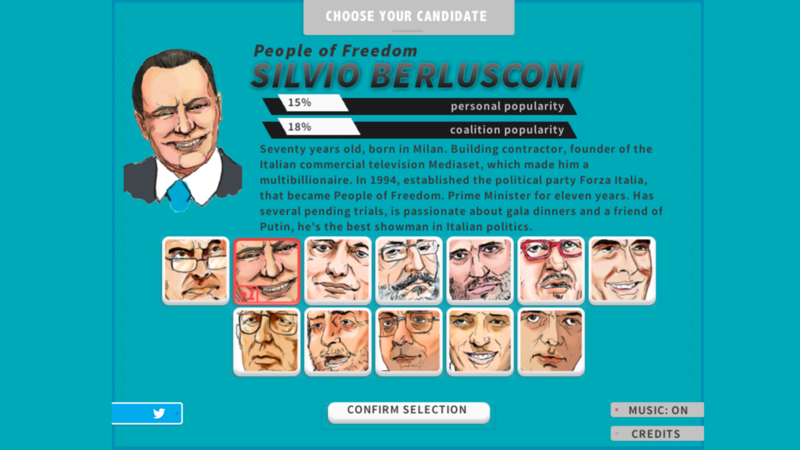 What will Berlusconi say to regain popularity? In the game, players can join real events or invent your own, improve the popularity of their favorite candidate, or destroy the career of their least favorite. Every turn lasts a week and players are able to release shocking statements, participate in events, manage their coalition, and check the reactions of the press. Every choice influences your candidate's popularity and that of his party. Developed in collaboration with Double Fine Senior Programmer Anna Kipnis.